Ah Australia, my home Grand Prix. Ever since signing that contract with the Virgin Racing team I was finding it hard to contain my excitement about racing around this circuit, performing in front of my fellow countrymen and fans and enjoying a circuit that, previously, I had only watched from the comfortable surrounds of my home, or whenever I attended the street circuit as a spectator. Sure, my racing career and knowledge that comes with it means that I knew, roughly, how the track faired in terms of actually driving it, but even so I suspect that I will be quite surprised when I have my first few laps around the Albert Park circuit. To say I’m looking forward to it is an understatement, even if I’m once again severely nervous about not only partaking in my second ever Grand Prix, but to do so in front of my own people. It can’t be as bad as Bahrain though, can it? Well here goes nothing, my first attempt at a circuit I’m familiar with -- which by the way is instilling some confidence in me that I wasn’t expecting -- yet remains foreign given the fact I’ve never driven around it; the simulator back at the team’s headquarters doesn’t count, nor do the many videogames I play in the interim. The team has put a set of Prime tires on so I guess I’ll go out and give Albert Park a crack before it gets too populated by the other drivers. Well… If I’m to be honest, I really don’t know what to say about the Melbourne circuit. My familiarity paid off as I got up to speed with the track rather quickly, and I had confidence to boot which helped me get into a nice rhythm as I did lap after lap. 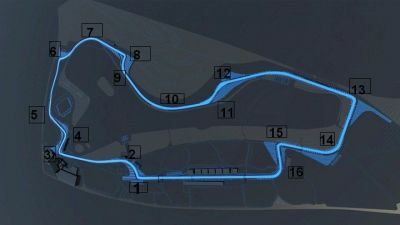 The circuit is certainly a different beast to that of Bahrain, its corners much faster and the lap over much quicker than that dusty, desert-based track. I really like how the a lot of the corners are sweeping around here, speed able to be maintained as the walls and grandstands, grass and gravel traps fly on by. It’s quite the picturesque venue too, the lake in the middle a nice -- if brief -- sight around some parts of the track, while the overhanging trees and tall buildings in the distance providing a nice, quaint contrast to the sheer speed of the circuit and surrounding tire walls, grandstands and run off areas. It also seemed to be slipperier than Bahrain which was surprising given the relatively clean tarmac of Melbourne against the dusty, sandy bitumen of Sakhir. I had to venture into the pits a fair bit during the session to try and find a setup that suited not only my driving style but the track conditions too; after a few visits I eventually found one that worked. Unfortunately, though perhaps unsurprisingly, I made a few mistakes, mostly run offs as I went wide on turns by missing the apex or dipped a tire into the grass making the wheels spin and slowly me down, but otherwise the session was a good, enjoyable and calm one that was both a blast -- to finally be on the circuit -- and a bit bland, with the other drivers not running that many laps. I took the opportunity to run as many laps as I could, to not only practice the circuit but also because I kind of had no choice thanks to the difficulty in finding a setup. I need to work on that final turn, managing the throttle around it being quite hard as the wheels want to spin and I want to reach full acceleration as quickly as possible. Perhaps playing with the setup will help with that issue. Last notable thing about the session was my surprise at just how much grip these cars have, the speeds that can be achieved through these long sweeping corners quite awe-inspiring. I can only imagine what it’d be like in one of the front-running cars, though don’t tell my team that… I also realised just how deep you can brake into a lot of the corners, my confidence in braking later and later growing as the session went on. Where before I was braking early to ensure I could hit the apex accurately (something I still didn’t achieve consistently), now I can brake really late and use the gears and technical grip of the car to help me still hit the apex and get through. It’s really quite remarkable and perhaps even astonishing at just how well these cars can perform and I look forward to enjoying more of it in the following sessions. If it means anything, I finished the session in 12th position. This session was also reasonably decent, with me deciding to put in as many laps as I could in the allocated 90 minutes just to ensure I got acquainted with the track and ironed out any issues I may have been having. As soon as I went out I noticed that it was quite overcast and quite darker too due to the late afternoon time that the session was scheduled, conditions that both worked together to change the ambiance and general appearance of the Albert Park circuit. It posed a slight challenge too as I had to find new braking markers and points as the shadows I was using before had moved or disappeared altogether. That final turn is still proving troublesome and I accidentally cut turn 6 a few times when trying to do some relatively fast laps. I was bewildered at just how fast this track is, too; not only do each lap go by very quickly, your sense of place on the circuit is confusing sometimes -- one minute you’re at turn 3, the next exiting turn 2 approaching the same corner again… it’s really quite insane! Unfortunately I caught the curbing wrong on the exit of turn 8/9 and spun into the inside wall in my second run, requiring a visit to the pits and some lost time as I received repairs. I also cut turn 12 unintentionally -- I need to stop doing this. I also picked up on the fact that the curb on the exit of turn 4 is something to be mindful of as I caught it and got thrown into the wall on my third run. The fourth run wasn’t as bad though with some good, clean laps occurring in quick succession leaving me with the feeling that I had made some progress. I also seemed to have improved with my approach, control and exiting of that final turn, leaving me even more confident as the weekend progresses. Despite a forecast of no rain I had to laugh when it started to lightly sprinkle, it didn’t last long though dissipating very quickly. 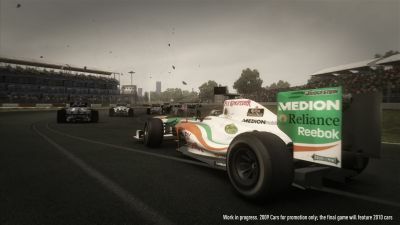 I got a warning in the session for colliding (gently) with Adrian Sutil who had just came out of the pits and was slow while I had just started a hot lap. I was a little annoyed with the warning because he was holding me up (not the other way around) and blocked multiple times, not showing anywhere near enough courtesy and certainly not respectful like the other drivers. All up I did around 20 laps, managing a lap time of 1:30.153 in the process which put me as high as 9th. I quite enjoyed this session as it was a clear, sunny one with some light fog that vanished as the session progressed. It just looked really nice around this beautiful track. I caught turn 4’s exit curb again and spun but managed to avoid the wall this time, thankfully. I had to come into the pits briefly to go to the toilet which, in hindsight, is quite amusing -- lesson learned: go before a session starts next time! I had a horrible second run, coming out of the pits right in front of Felipe Massa and Liuzzi who were close to each other, blocking both unintentionally as I was warming up. Massa even connected with the back of my car, giving us both damage. Then, on the final turn, I spun (guess I haven’t mastered it yet) and hit the wall, dislodging my front wing in the process. Naturally I went back to the pits for repairs before going out again for more laps. Each and every time I started a flying lap on my third run, someone came out of the pits, impeding my progress and slowing me down. 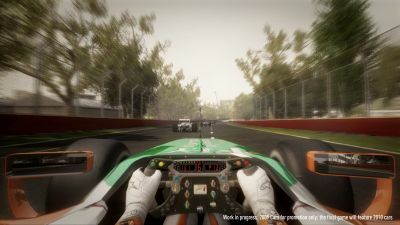 First it was fellow countrymen Mark Webber so I slowed and aborted the lap, then again with Kamui Kobayashi. To his credit he moved aside to let me through but by then it was too late and I once again aborted the lap. The fourth run was good as I passed any cars I came across and did my own thing until the in lap on the way back to the pits where I bounced off the curb of turn 12 wrong and got thrown into the wall. I ended up with front wing damage yet again, meaning yet another venture to the pits and more time lost. Overall I finished Practice 3 in 9th position with a 1:29.785 lap time, my best time so far around the Albert Park circuit. I’m happy with my performance despite the odd mistake, and I look forward to Qualifying later in the afternoon. I had an interview after P3 where I was asked about my feelings driving at my home Grand Prix, how I think my car is handling a full fuel load and how I will be approaching each race. I answered by suggesting I’d be cautious but optimistic about driving around Melbourne, content with how the car handles a full tank of fuel and that I wasn’t thinking about the next race or any future ones, just the current one. The interview seemed to go okay though I wish I’d get asked easier questions. I’m approaching this session casually, not expecting too much other than to meet my team’s expectation which is to qualify 15th or higher. Given my times in the practice sessions I think that’s realistic and achievable. So Q1 went quite well as, once again, I made it through to Q2, this time with a 1:30.422 which put me in 15th exactly. Option tires really grip up when it’s bright and sunny, I noticed, making it a pleasure to push the car and work on improving my lap times. I stuffed up my second flying lap (the first of my second run) on the last corner (again) by getting some oversteer and having to correct it, then accidentally cut turn 6 (again) on my way back to the pits for fresh tires. Old habits creeping back in under qualifying pressure, perhaps? In Quali 2 I had to abort two flying laps, first getting sideways out of turn 2, then on the second lap I went wide at turn 3. My third lap, however, was better so it wasn’t too bad. My second run in Q2 was though as Alonso came out of the pits and blocked my flying lap so I aborted. Going again on the next lap, I dipped my tire too much over the inside (apex) curb of turn 1 which was deemed to be cutting the corner (Jesus I need to work on this!) and thus, it invalidated my lap. As time had expired for Q2 and I didn’t have a good lap, I was eliminated with a final position of 17th, below both the team’s and my expectations. Needless to say, I’m quite disappointed given that it’s my home Grand Prix and that circumstances seemed to be against me, either due to my opponent’s or my own silly mistakes. Despite my poor qualifying position the team expects me to finish in 12th or higher, and after the mixed session yesterday I’m not sure if I can meet that requirement. Are they expecting the adrenalin of my home Grand Prix and the atmosphere of my supporters to lift me and ensure that I perform well, or are they seeing where I’ve managed to put myself in the practice sessions and basing their expectations on that? Whatever it is I will give it a red-hot go, but I’d be lying if I didn’t say that I felt the expectation was a little on the unrealistic side. Personally, I think 15th would be a more adequate goal. In a way though, I don’t think it matters -- this is my home Grand Prix. Finally, after months of waiting and anticipation, I am given the opportunity to race at my home track, in front of my home crowd. If that’s not something to be excited about, something to celebrate, I don’t know what is so I’m going to try and enjoy this as much as possible. If I have a good race and perform nicely, fantastic, even better! If not, well, surely I can leave Melbourne satisfied that I achieved a dream of mine and raced in the pinnacle of Motorsport, right on my back door-step. Wow, terrible race. Like, I want to rewind Sunday and attempt that again because that was just abysmal. My start was good as I managed to minimize wheelspin and maintain my starting position of 17th. I passed Kobayashi on lap 2 for 16th, and then proceeded to have a great battle with Rubens Barrichello for around seven laps, eventually passing him for 15th on lap 9. Unfortunately I accelerated too early out of turn 3 and lost it, clipping the wall and damaging the front wing (again), leaving me in 24th place. Last. Out of the pits and fully repaired, I went off at turn 3 on lap 12 and spun on the grass because I was too busy concentrating on staying out of the way of the front-running drivers who, already, were lapping me and shortly afterwards, the other backmarkers. Rather surprising how quickly they’re able to catch us at the back but that’s why they are at the front and we’re not, I suppose. On lap 15 I caught and passed my teammate Lucas Di Grassi as he visited the pits, then on lap 21 was surprised to hear that he had retired (yet again), leaving me back in last. On lap 22 I was overlapped by Barrichello which rubbed salt in the wound knowing that just a little while earlier, I had a great battle with him that I eventually won. On the same lap I cut turn 1 again, accidentally, receiving yet another warning. On lap 25 I went wide onto the grass at turn 8 though thankfully it was nothing drastic and I was able to recover quite quickly. The leaders had also caught me again, putting me down two laps instead of just the one. Thirteen laps later, on lap 38, I went wide at turn 8 yet again, this time because of a locked wheel. Again though it was nothing too bad and I could recover. At turn 3 I ran off, again due to concentrating on a front-runner who was passing from behind. This happened on lap 42 and then again at 15 (second last corner) as I missed my braking point. My tires began to go off at lap 45 which resulted in a half spin off turn 1’s curb during lap 47. I caught it and proceeded, though was getting quite frustrated with all the mistakes that I was making. From lap 47 onwards I managed to find a good rhythm and posted some good, consistent laps, calming down in the process thinking that I’d finish the race with this momentum. I was wrong, however, as I once again ran off at turn 8 due to a leader passing a slower car, both of whom had just passed me. This gave me a puncture on my left front tire, seeing yet another visit to the pits to get it replaced. By this time I was furious, really dejected with how the race was going and wishing that it was over. This only continued as I once again went off at turn 3, due to outbraking myself on lap 50. On the same lap I misjudged my braking again at turn 15, going wide but recovering thanks in part to the run off area. On lap 52 I went from 23rd, last, to 20th position as those immediately ahead of me (though over two laps ahead) had retired. It didn’t mean much given the woeful race but thanks to Pedro De La Rosa, Karun Chandok and Jarno Trulli for the free positions! On the same lap the race was finished as Webber had won, three whole laps ahead of me. Hamilton came second and Nico Rosberg managed third. Overall I’m sorely disappointed with my effort and the race in general, the weekend feeling worse than Bahrain and honestly quite embarrassing. It hurt to know that I had such a bad performance in front of my home crowd, my mood afterwards wasn’t pleasant and I was left with a feeling that I wanted to pretend the race never happened and that I never participated. My agent put things into perspective though, highlighting my decent start and nice little battle as positives, as well as my improved general consistency over the entire weekend. When she said this I became a little happier but I still can’t take any consolation from what was an abysmal first home Grand Prix, something that will probably stick with me and my career forever even if, by chance, any future attempts at the circuit -- if I’m lucky enough to get that far -- are remarkably better. All I can do now is hope that Malaysia is a lot better because if it’s not, I’m not sure how I can take three poor races in a row. Note: Sorry about the repetition of that second image, as well as the poor map. Finding images for this game isn't easy, unfortunately.